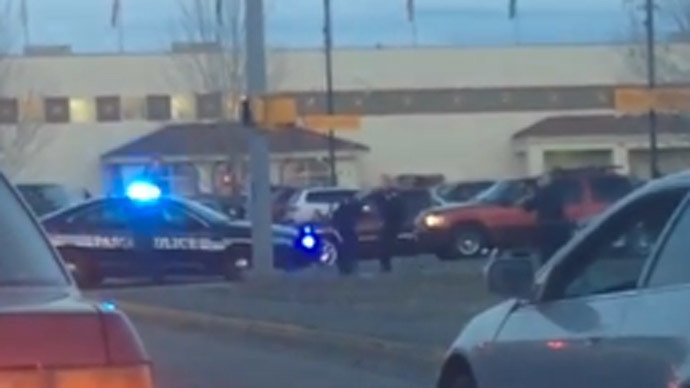 An investigation is under way into three law enforcement officials with the Pasco Police Department in Washington State after cops there shot and killed a man this week who had reportedly been throwing rocks at officers. Video footage purported to be from the incident appears to show the victim, 35-year-old Antonio Zambrano-Montes, fleeing on foot from three Pasco police officers across a busy intersection with arms akimbo. The man then turns and faces the cops with his arms in front of him when a barrage of gunfire — as many as 13 shots, according to some accounts — is fired from their guns, fatally wounding him. Eyewitnesses say that Zambrano-Montes was unarmed at the time of the shooting and, according to one, was “just trying to walk away” when he was shot and killed. Local media outlets have since reported that the man has had a history with local law enforcement and had been released from police custody only one day before he died. Chief Bob Metzger says that police arrived on the scene moments before Wednesday’s officer-involved shooting after being alerted that a man had been lobbing rocks at nearby vehicles. When the cops approached Zambrano-Montes, the chief said the man threw at least one “softball size” rock at the officers and then ignored their orders to put down the rest of his projectiles, prompting the police to deploy their Taser stun-guns “with no effect on the subject,” according to Metzger and eyewitness accounts. At least two officers were injured by the rocks, according to the Seattle Times, and were treated at the scene. "With the threatening behavior by the subject toward the public and the officers during the altercation, officers immediately fired on the subject with their service weapons and the subject went down,” the police chief said at a news conference Wednesday. Video footage purported to be of the shooting surfaced to the web shortly after the incident quickly unfolded, propelling the ordeal to the forefront of local news on Wednesday and raising questions from residents, including those who saw Zambrano-Montes killed with their own eyes. “Yes, he was resisting. Yes, he was wrong. But it looked like there might be something wrong with him. And he wasn’t hurting anyone. He had a rock, not a gun. It seems it could have been handled differently,” said Patrick, who had planned to attend a rally on Wednesday outside Pasco City Hall to protest the killing. Another demonstration is currently scheduled for the same location on Saturday. At Wednesday’s news conference, Chief Metzger said he was unsure if Zambrano-Montes was armed with anything other than rocks during the ordeal of if any weapons had been recovered. "It could have been avoided, there could have been other ways around it," she said. Police spokesman Capt. Ken Roske initially declined to release the names of the officers involved, but later identified them as Officers Ryan Flanagan, Adam Wright and Adrian Alaniz. All three have been placed on administrative leave pending the result of an internal investigation that may take months to complete. One of the three officers involved in Wednesday’s shooting, Flanagan, has previously been identified along with another cop in an excessive force lawsuit filed by a Pasco resident in 2009, according to the Los Angeles Times. The city ultimately settled the lawsuit for $100,000, the newspaper reported. Flanagan is a nine-year veteran of the Pasco Police Department, according to local media. Wright and Alaniz have been on the force for eight and two years, respectively. According to KNDO, the NBC affiliate, a record check revealed that police had responded to an incident last year in which Zambrano-Montes is alleged to have been hitting cars with a broom. When cops approached him, the network reported, Zambrano-Montes apparently began throwing items at the officers, including a rocking chair, and then tried to take one of their guns. He was ultimately hospitalized and treated for methamphetamine use. A bench warrant was also issued only two weeks ago for Zambrano-Montes' arrest, according to the Los Angeles Times, after he reportedly failed to appear at court for an unspecified charge. It’s unclear when he was apprehended with regards to that complaint, but the Times reported that Franklin County court records show that Zambrano-Montes was released by the police on Monday, one day before his death. The Tri-City Herald described Zambrano-Montes as a Mexican-born orchard worker who didn’t speak English but spent the last decade or so in Pasco. His cousin, Blanca Zambrano, said the victim is survived by two daughters. NBC News could not immediately verify the authenticity of video footage purported to be from Wednesday’s shooting, but the Associated Press reported that the person alleged to have filmed it, 21-year-old Dario Infante, said he recorded it from his car after he saw one of the officers deploy his stun gun. "He didn't throw any rocks after he started running," Infante said of the shooting victim. Police have reportedly identified other recordings of the account and are reviewing them as part of their investigation into the shooting. Pasco is a town of around 66,000 situated in southcentral Washington, northwest of Walla Walla. According to the AP, Tuesday’s incident marked the fourth fatal officer-involved shooting in Pasco in six months.